Sandy Lake is situated in Bedford, Nova Scotia. The lake is a major water body within the Sackville River Watershed. It’s health is vital to the ecology of the area. Like most urban lakes, anthropogenic (human) activity impact water quality negativley. Sandy lake is no different, with the tropic status trending towards worsening water quality. Development pressure is placing the lake and associated wildlife further at risk of accelerating the current negative trend. It is imperative that environmental stewardship is championed to slow and possibly reverse this trend. The Sandy Lake Regional Park is currently one thousand acres. It has been recognized for nearly five decades, provincially and municipally and in multiple reports and studies, to be a unique landscape worth protecting, but the final 1000 acres have never been saved. In 1971, P.B. Dean was hired to identify areas “Unique in the Halifax Dartmouth area or important on a regional or provincial scale.” The Sandy Lake to Sackville River area was one of seven unique “jewels” – priority areas to be protected for their ecological richness and for community education and recreation. Time is running out for Sandy Lake. Twists of fate have caused housing development to be on a parallel path. The area remains unique and ecologically intact. The lakes are bordered by rich drumlins that support magnificent mixed, multi-aged Acadian forest with significant old-growth stands and striking “pit and mound” topography. A wide variety of natural elements exist all in one place, and they are species-rich, including rare species and important turtle and moose habitat, for example. One is a big marsh lake, one a deep “blue lake” (Most in this part of NS are “brown lakes”) and the third a boreal forest lake. Just over 1000 acres are waiting for protection. The forests and waterways west and north of Sandy Lake were part of the original park “gem”. They are all that is left of this essential sub-watershed of the Sackville River. This area slated for development is where most of the surface water enters the system. Significant further settlement within the Sandy Lake watershed would make the lake inhospitable to the migratory fish, reduce wildlife diversity, as well as increase flooding downstream in the Sackville River flood plain. To understand why in more detail, see http://versicolor.ca/sandylakebedford/lakes/ and see the presentation at http://goo.gl/ipYCR2. 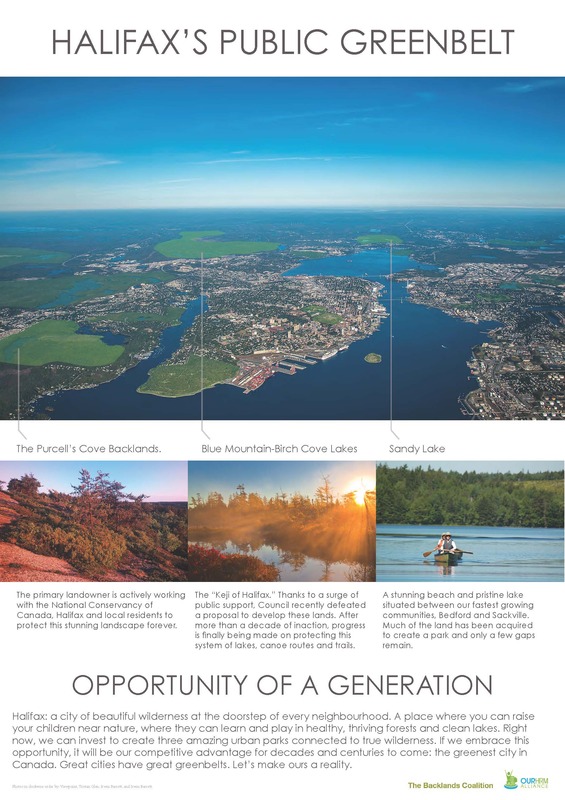 The area is an important area to be preserved by Halifax’s new Green Network Plan (HGNP). The HGNP identifies the Sandy Lake area as having 3 important wildlife corridors in the lands west, north, and east of Sandy and Marsh lakes, including in the developer’s property. It is an essential sub-watershed of Sackville River system, which is one of the main “spines” of the Green Network Plan. Natural recreation The area is already used unofficially by citizens of HRM for multi-recreational purposes through a network of existing trails, including mountain biking, birdwatching, swimming, paddling, fishing, dog-walking, cross-country skiing and snowshoeing, to name a few. The community and the public are working to save this irreplaceable natural area. The developers who own the essential watershed to the west of Sandy Lake are showing themselves to be as community-minded as we had heard. We understand they will accept a trade for other lands of equal value if the city will work together for such a win-win solution. Some city councilors and others are already aware and helping, but there is more to be done to achieve this. A strong group of regional organizations, called The Sandy Lake Regional Park Coalition, has formed to raise awareness and protect this treasure that sits in Bedford at Sandy Lake – for wildlife and for future generations to enjoy as those have before them.